This quick, easy Slow Cooker BBQ Chicken with Coca Cola is the perfect recipe for your family to enjoy! Pour Coca-Cola and BBQ sauce over chicken. Cook on high 4 hours or until chicken is completely cooked. 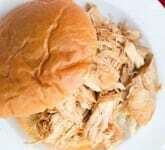 For sandwiches, shred chicken and serve on buns. Top with more BBQ sauce if desired.